A man has been found guilty of the murder of a former champion boxer in a row over smoking at a London nightclub. 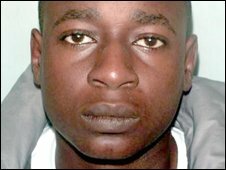 Kanyanta Mulenga, 23, from Putney, shot James Oyebola in the neck and leg in July 2007 at Chateau 6, in Fulham in south-west London. A jury at the Old Bailey heard how Mulenga, who had denied murder, fired at Mr Oyebola, 46, after he asked a group of men to stop smoking. Prosecutor Jeremy Donne described the attack as "particularly senseless". 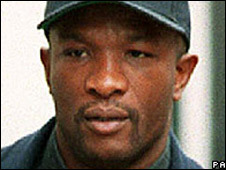 Mr Oyebola, a former British heavyweight boxing champion, died four days after the shooting in July 2007, which happened three weeks after the smoking ban began in England. Father-of-three Mr Oyebola asked a group in a "perfectly pleasant way" to extinguish their cigarettes in the club's garden area, which counted as enclosed premises because it had a roof, the court heard. A witness said Mr Oyebola, who was 6ft 9ins tall, was then jostled by three men. "He thought it looked like a giant against kids," said Mr Donne. Mulenga then fired off four shots with a converted replica Baikal automatic pistol. Two bullets hit Mr Oyebola - one causing superficial injuries to his right calf and another entering the back of his neck, piercing a major vessel supplying blood to the brain. He died in hospital without regaining consciousness. Judge Peter Rook warned Mulenga that he faced life imprisonment. He had been jailed for 30 months in September 2005 for possessing heroin and crack cocaine with intent to supply, the court heard. Mulenga was remanded in custody to be sentenced on Thursday. The victim's partner Malin Bergstrom said in a victim impact statement: "James was a warm, kind-hearted, generous person." She said he was a "father, role model and a friend" to his children. The couple had two children together aged nine and 14. Outside court, police read a statement from Mr Oyebola's family that said: "There are no winners today. "Those central to the case have lost someone or something. Many lives have been changed forever." They added: "We do not hate this young man found guilty today; on the contrary we feel sorry for both him and his family." Last month Rene McKoy, 20, of Battersea, and 24-year-old Dean Francis, of Wandsworth, south London, had murder charges against them dropped. A fourth man, who cannot be named for legal reasons, will face a separate trial.